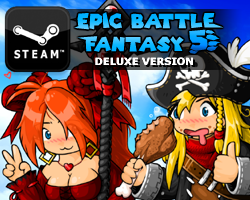 EBF3: Updated version on Kongregate! 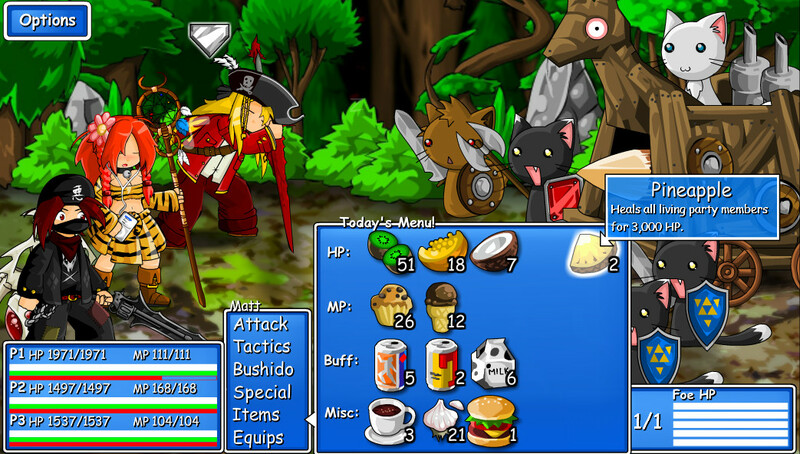 I updated Epic Battle Fantasy 3 with some major usability features for 2016! 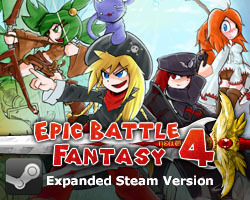 The Kongregate version is now almost the same as the Steam version. • There’s a little options menu which includes sound, frame-skip, and quality. • There’s a wave counter in battle now! • Scanned foes’ information can now be viewed at any time during your turn. • Minigame achievements are noticeably easier. • Text pops up when a status effect is inflicted. • The party heals faster when walking around later in the game. • There’s more useful tips scattered around the menus. • Bitmaps are higher resolution and the game should look better in cinematic mode. • There’s more fanart in the gallery now. • Some links and credits have been updated. • Lance’s general defence buffed by 10%! This entry was posted in Epic Battle Fantasy 3 on October 6, 2016 by Matt Roszak. I presume by cinematic mode you mean screens like cutscenes and the battle screens? Enabling full screen would have much better, but I guess that’ll do. Bob, Sounds like a nice game. And fyi, we all have fingers phones or keyboards that don’t always type what we want when going fast. ?